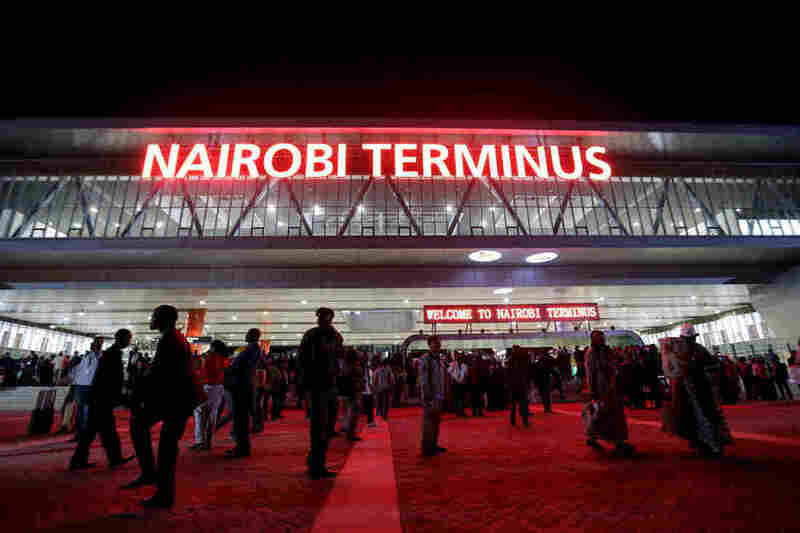 Red neon announces the "Nairobi Terminus" at the Chinese-financed Standard Gauge Railway station in Kenya's capital. The Standard Gaug e Railway station in Nairobi is easily the most impressive public building in Kenya. The train runs 293 miles from Kenya's capital city to the port of Mombasa and back twice a day and represents the biggest infrastructure project since Kenya's independence 54 years ago. The Chinese financed it; a Chinese company built it; and the Chinese will operate it for many years to come. The project, which launched in the summer of 2017, has not only come to signify Kenya's ambitions, but also China's ambitions on the African continent. In the past decade, China has become the biggest lender to governments in Africa. The money has helped build ports, roads, bridges, airports and trains. But critics warn the loans are full of traps that could leave African countries in the lurch. Kenya alone owes $5.3 billion to China. China's $3.2 billion loan for the railway project is hard to ignore. At the entrance of every single rail car, an image of the Kenyan flag is flanked by one of the Chinese flag. Since the railway line opened for business, hundreds of thousands have taken trains to and from Mombasa, a strategically important port on the Indian Ocean. Riding in economy class from Nairobi, two strangers are having a spirited argument. Paul Gichango, a marketing executive, says Kenyans can learn something from the Chinese. They built nearly 300 miles of rail ahead of schedule. He says when he would drive past the construction site in Nairobi, he saw the Chinese working nonst op. They'd start at 6 a.m. and work until 7 at night. It's a culture that turned a poor country into an industrial powerhouse, he says, and Kenyans would be wise to pay attention. But as he talks, Faith Kidullah, a lawyer sitting right next to him, interrupts. "We are not interested in [Chinese] culture," she says. "We brought these people here for their technology. So they should just bring us the technology. They can just remain with their own culture." In early July, Kenyan media were full of news stories about the railway. The Standard newspaper had published pictures of Kenyans allegedly being physically punished by Chinese managers. "Chinese nationals have created a small kingdom in which they run roughshod over Kenyan workers who say they are experiencing neo-colonialism, racism and blatant discrimination," the paper reported. The paper revealed that the only time Kenyan workers had taken control of a locomotive was on opening day, a year ago. During a parliamentary hearing, the government defended the railway, saying most workers (nearly 2,679, compared with 841 Chinese) were Kenyan. But the Chinese still hold most supervisory positions. 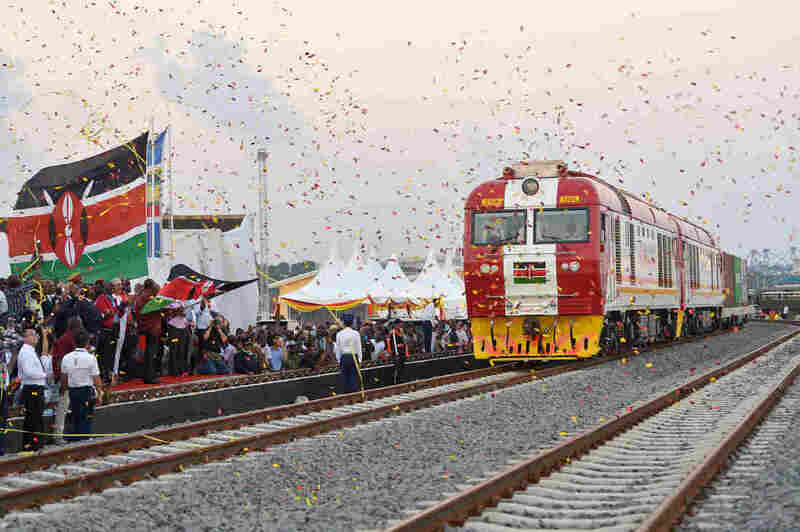 People cheer and throw confetti after Kenyan President Uhuru Kenyatta flags off a cargo train for its inaugural journey to Nairobi last year at the port of the coastal town of Mombasa. The media also raised questions about how costly this project had been and how Kenya may not be able to repay the Chinese. Either way, Gichango is unmoved. Kenyans like to talk, he says; they like to take breaks. Chinese are not like that. "There is no idle time, that element of [no wasted time] is what I admire very much," he says. And as he says that, a woman sitting across the aisle jumps in. "This guy is colonized," she shouts dismissively. What's happening in Kenya is happening across the African continent. The International Monetary Fund says 40 percent of low-income countries in the region are either debt-distressed or at high risk of becoming debt-distressed. And China is playing a big role. Beijing has handed out billions for projects in countries including Ethiopia, Ghana and Mozambique that other foreign powers tend not to invest in. It means Ethiopia got a new rail line to the port of Djibouti and Ghana has an expressway and Senegal will eventually be part of a pan-African highway spanning from Dakar in the west to Djibouti in the east. But there are worries, says Grant T. Harris, who advised President Barack Obama on African issues. "By some estimates, the Chinese loans have bumped up Djibouti's debt-to-GDP ratio from 50 to 85 percent, only between the years of 2014 to 2016," he says. "So we'r e talking about a lot of money owed to China." Harris says these Chinese loans are very different from other international loans because the terms are often secret. Many times, he says, they don't require the same kind of feasibility studies or environmental studies that other international loans require. And when it comes to default, few people have insight. "What we do not have transparency on is what really is the collateral," he says, "and the very scary case in point is Sri Lanka." At the end of last year, Sri Lanka found itself struggling to pay back its debt to China, so it handed China a strategic port on a 99-year lease. So what happens if Djibouti can't pay back its port? What happens if Kenya can't pay for its Standard Gauge Railway? Anzetse Were, a development economist, says the problem is we don't know. "As a public intellectual who analyzes the African and Kenyan ec onomy on a weekly basis, at no point have I come across a document that I can say, 'Oh, so that's what the SGR is about,' " she says. NPR asked the Kenyan government what would happen in case of default, but received no concrete answer. Instead, government spokesman Eric Kiraithe said the terms were in line with international norms and that Kenya had enough in its coffers to pay the loans as agreed. Chinese Ambassador to Kenya Sun Baohong defended her country's involvement in the continent at a news conference in July. "There is no debt trap with Africa," she said. The Chinese Embassy in Kenya denied NPR's request for an interview. 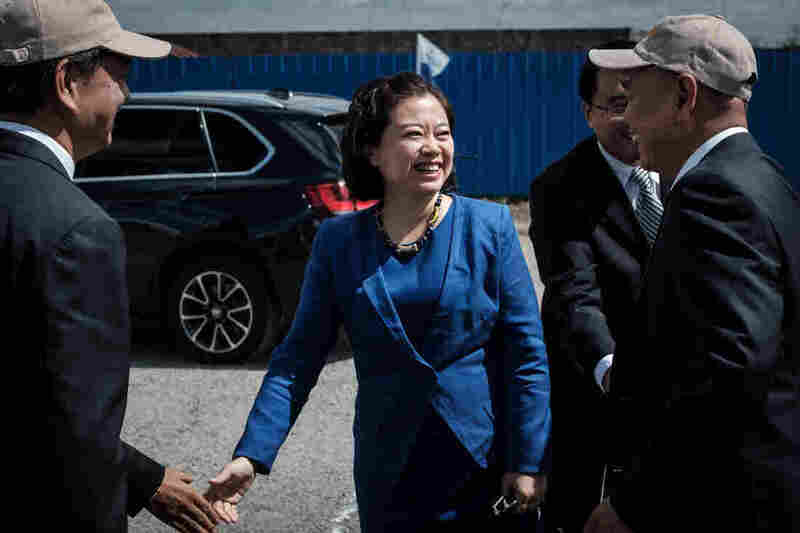 But at a news conference in July, Chinese Ambassador Sun Baohong defended her country's involvement in the continent. "There is no debt trap with Africa," she said, adding that the continent has historically had a huge debt load. Were says these types of opaque deals work for many recipient governments â" they let them build visible projects, which helps them win elections. And they c an also be a source of income for corrupt politicians and their supporters. But for ordinary people, the opacity raises concerns, and lately in Kenya, there has been public outcry. "African governments may be happy with the opacity, but African publics are not," says Were. "And fundamentally, the sentiments on the ground [are] really going to inform how successful and how well received their initiatives are in the country as a whole." The Standard Gauge Railway station in Mombasa sits on a hill overlooking wetlands, and all around it, you see Chinese work: brand-new paved roads and tall bridges crisscrossing the wetlands. Chinese workers zoom past in pickup trucks. And off to the sides, behind 12-foot fences and guard towers, there are brand-new apartment buildings. The red lanterns at the entrances reveal they are Chinese dwellings. At the top of a windy bluff, Charle s Oduour is washing his car. He's a driver, and like a lot of others in Mombasa, he thought he'd one day be working on the railroad. But these days, he says he's not even allowed past the station's initial checkpoint to try to find work. He says in more than one year since the railway opened, he has never spoken to a Chinese person. He says the Chinese have typecast Kenyans. They think all that they're good for is to clean or move rocks for construction. "I'm feeling very bad," he says. "Because they are in our country but they don't interrogate with us, tell us what we can do, how we can survive or how we can know more [of] what they are doing there." He feels like something that was supposed to bring jobs, that was supposed to bring pride, belongs instead to someone else.